What were your wildest dreams as a child? Favorite holiday meals? If you could write a letter to your future grandchildren, what would you say? For mothers and daughters, Treasured Passages offers the perfect inspiration to pick up a pen and share memories of our youth, adulthood and parenthood. One of the founders, Whitney Biggs, is a cancer survivor who lost her own mother to the disease. 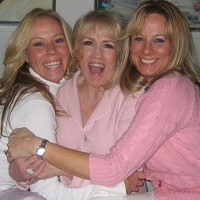 As she came to grips with the realization that her mother would not know her children, and her children would not know their grandmother, Whitney and her two Treasured Passages co-founders came up with the idea of letter books to capture special memories and share them with future generations. Treasured Passages’ Mother Daughter Letter Book is a guided scrapbook, filled with prompts to encourage mothers and daughters to revisit their pasts and write down their experiences. The book includes cards that are meant to be exchanged, and each page suggests an activity to be done or a letter to be sent. Over time, as the cards find their way back into the book, you’re building a beautiful keepsake of a treasured relationship and an irreplaceable family heirloom. There’s no substitute for handwritten notes, but many of us have given up paper correspondence in favor of more immediate electronic communications. The Mother Daughter Letter Book is a wonderful reminder to take a break from email and text-messaging and practice the art of letter writing. Every note or entry might not be perfect (after all there’s no spell check or autocorrect) but they’re 100% authentic. Hi there! I am Whitney, one of the creators of the Mother and Daughter Letter Book. I am so very grateful that you have found it. We created the book because we believe in three things: love others, tell them often and capture those memories so that future generations know their “back-story.” I would love to answer any question you might have today. How can I help you? I'm wondering if the "guided questions" would be relevant for me and my mother since I have no children. My two sisters do, however. These letter books are really timeless and perfect for your sisters as well. There is also ample space for photos, recipes, and mementos. Absolutely- no kids required! : ) The guided questions are all about you and your mother. There is only one page that is truly meant to be written for kids which is the hope chest page. On that page we ask that the grandmother write a letter to her grandchildren born or unborn. The rest of the questions are meant for the two of you. Thanks so much for that question! Could I complete this book for my sons? Great question and I wish I could say yes but it has "daughter" written all through it. We have had many requests for a Mother and Son Letter Book so maybe that will be next! Thanks for your question! While I commend you on the promotion of your product, I saw one thing that is missing, which I feel is important. When a genealogist or an archivist sees this description of your product, they want to know if the papers being used and the box as well are acid-free. Is the paper archival paper? Suggestions on storage, etc. I don't see that. Again, the concept is a good one, considering the fact that all people have a life and a story to share. Thanks for that suggestion! The paper is not archival paper nor is the box. The pages are on heavy stock paper (190 gsm artboard) so as to hold up better than regular pound paper. My mother was actually a genealogist- I guess it runs in the family! Thanks for taking the time to share your thoughts! We have done a little more research on the artboard that we use in the book. According to our manufacturer it actually does meet the acid free requirement. I have two younger daughters ages 11 and 7. Is this book intended for my mother and myself or can I use it to give and prepare for my daughters? Yes! We think pre-teen is a perfect age to start this book. It will encourage positive communication during what can be hard years. A few samples of the questions (both mom and daughter are supposed to answer) the reasons I am proud of you, you inspire me because, three words that describe you, each of you will write your life lists...I hope that helps. Some cards can even be saved and sent when the timing is appropriate. Thanks for taking the time to ask that question! I just realized I didn't completely answer your question. This book can really be for you and your daughters (they need to be old enough to understand and write their responses) or you and your mother. Hope that helps. This is such a beautiful thing you have come up with. Everyone should do it now, because you never know when something will happen that makes it impossible to share those memories with each other. That is really so true. I never knew how much I would want my mom's words and thoughts until she was gone. I tell my children about her and what she valued so that they might know where they come from, but I so wish for something tangible from her to give to them that truly speaks to her personality. Thanks for your kind words about the Letter Book. I appreciate you taking the time to share that. What were your wildest dreams as a child? Favorite holiday meals? If you could write a letter to your future grandchildren, what would you say? For mothers and daughters, Treasured Passages offers the perfect inspiration to pick up a pen and share memories of our youth, adulthood and parenthood. One of the founders, Whitney Biggs, is a cancer survivor who lost her own mother to the disease. As she came to grips with the realization that her mother would not know her children, and her children would not know their grandmother, Whitney and her two Treasured Passages co-founders came up with the idea of letter books to capture special memories and share them with future generations. Treasured Passages’ Mother Daughter Letter Book is a guided scrapbook, filled with prompts to encourage mothers and daughters to revisit their pasts and write down their experiences. The book includes cards that are meant to be exchanged, and each page suggests an activity to be done or a letter to be sent. Over time, as the cards find their way back into the book, you’re building a beautiful keepsake of a treasured relationship and an irreplaceable family heirloom.